At MF Steel we pride ourselves in offering an turnkey security systems, from the steel work to the electronic systems. MF Security Systems does domestic and commercial electric fence installation in the West Rand and Randburg Areas. We also repair and maintain electric fences. MF Security Systems provides installation and repair services of alarm systems for residences and businesses. As a dedicated local home security systems provider in the West Rand and Randburg areas, your safety is of the utmost importance to us. MF Security Systems does domestic and commercial intercom systems installation in the West Rand and Randburg Areas. We also repair and maintain intercom systems. MF Steel has over 20 years of expertise and experience in the manufacture and installation of palisade fence panels and steel fencing, we will make sure your property is effectively protected. 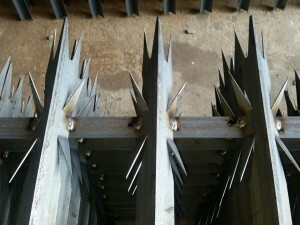 All our palisade fencing is manufactured right here at MF Steel in Roodepoort, and is of the best quality. The workmanship on all our products are guaranteed for 1 year. Are you looking for secure perimeter fencing without impeding on your view? Clear View Fencing is the way to go and the good news is that we at MF Steel can assist you. In South Africa it has become the norm to secure your home and property with burglar bars and security gates. At MF Steel we know the importance of securing your property and loved ones. We use only the highest quality material to ensure that it not only look good but serve to keep intruders outside. Our Burglar Bars and Security Gates are made from 25 square tubing, 12 square bars. We offer standard and custom made bars and gates. The workmanship on all our products is guaranteed for 1 year. At MF Steel we custom make driveway gates to suit your requirements. We also do the installation of intercoms and driveway automation systems.